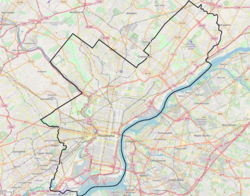 Normandy is a neighborhood in Northeast Philadelphia. It is located east of Roosevelt Boulevard, in the vicinity of Woodhaven and Byberry Roads, built in 1955- 1956. All of the streets in this neighborhood begin with the letter N. The neighborhood is made up of Cape Cod-style single-family homes, with frame construction. Most of the homes have received additions over the years. The original landowners were Joseph Buckman, who owned 73 acres (300,000 m2) and John Rieger, who owned 18 acres (73,000 m2). Kraft Foods currently operates the old Nabisco/Mondelez International plant at the southwest corner of Roosevelt Boulevard and Byberry Road. Devon Self-Storage occupies what used to be Best products, also what was the original Normandy Square market. The Northeast Village was a wartime military housing project just south of the present Normandy Village. This page was last edited on 29 October 2017, at 09:29 (UTC).